logger "Ultimate Loader requirements met. Onward and upward!" logger "Ultimate Loader requirements NOT met. Review: `echo $jaguar`"
logger "Ultimate Loader requirements NOT met. Review: `echo $media`"
logger "Ultimate Loader requirements NOT met. 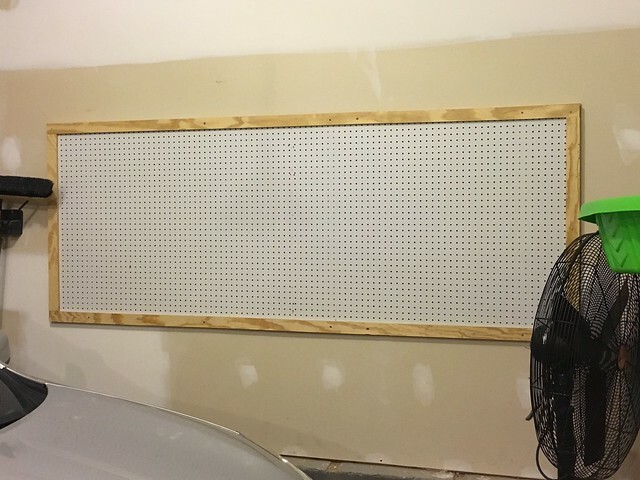 Review: `echo $loglocation`"
As a side project, I picked up this garage pegboard setup from a guy off Craigslist. I had wanted to plan one out and put it together myself, but free plus an already-cut-to-size and layered mounting arrangement (which ironically didn't quite fit my stud spacing) isn't something to walk away from. I'll later surround it with shelving of various sorts and throw Killz mold-resistant primer up on the walls to increase garage brightness. And, with shelving all around, I'll be able to put sliding lucite panels in front of this to keep the kids out. How do you get the device to map that way? Some udev rule? Yes, my mistake, ULV. I had some shortcuts assigned (during much earlier work) and remember wondering what I was up to as well, then promptly got the name stuck in my head. Thanks for spotting that. Correct: udev. All my devices were coming up randomly and it's especially necessary for the Jaguar and GPS arrangement to have predictable device names. The main problem with this script is that it will likely claim the Jaguar and FreeEMS interaction, a problem when trying to use any other applications. I haven't tried using anything else when ULV is in watch mode though it's a safe bet since this is normal behavior in *nix environments. This is true, but you can simply watch the file that it is writing, or use a serial splitter app at a first stage. Ideally your dash view will also be your logger, or attached to a standard localhost port as a stream of interesting named values. Digression: Some time ago I picked up an Evo TD05HR 16G turbo that ended up not including a wastegate actuator. Can't seem to find any cheaper than $50. If anyone has a good source for one, please hook me up. The one in the link above is $65 and maybe that's the best I'll do. After getting my Pi running as-is, the next generation of software will likely rely on this guy's work featuring Kodi as the platform. I've gotten comfortable with Kodi via OpenElec, but never thought of cramming it into a dashboard, let alone as elegantly as this guy did and with existing modules for FM radio support, media, weather, and navigation (I'm using NavIt as well). The only difference with my setup is I'll use the IR sensors to then control audio levels or station tuning depending on what's on-screen at the time. Waving one's hand around makes it easy to do such things without even touching the screen or taking your eyes off the road. External wastegates are betterer because they are more consistent at controlling boost and the manifold you buy will likely have fittings for one, and you can easily adjust the pressure by swapping springs. But they are a bit more $ and a lot less stock looking. I dislike internal wastegates a lot. But you should not be swayed by me. One thing you may wish to consider is trying to adapt an actuator off any other similar turbo and adjusting brackets etc to work correctly or near correctly. Might be cheaper if price is the goal. Thanks for that explanation. I was having trouble seeing how it mechanically worked with the Turbo and assumed voodoo. This is true, but you can simply watch the file that it is writing, or use a serial splitter app at a first stage. Ideally your dash view will also be your logger, or attached to a standard localhost port as a stream of interesting named values. I had been playing with socat some time back to try to redirect FreeEMS serial comms over TCP/IP. The objective is to network the gauge display with the Pi touchscreen device, the former essentially being a "dumb" display of data and the latter handling logging and CAN. For some reason, socat wouldn't play nicely even when everything was set ideally and I could transfer dummy data as a test. Your comment turns that on end. Since ULV is already validly reading comms and writing logs, I can easily use ULV to solve the problem of logs and gauges at the same time: send the stream to a log (as I'm already doing) and split that stream to socat and there-by the gauge display over TCP/IP instead of trying to pull from the Linux device itself using a delicate arrangement. ULV essentially becomes the air traffic controller for any device that wants read access. The only thing that might thwart your plan is potential chunked buffering when writing to the log file. 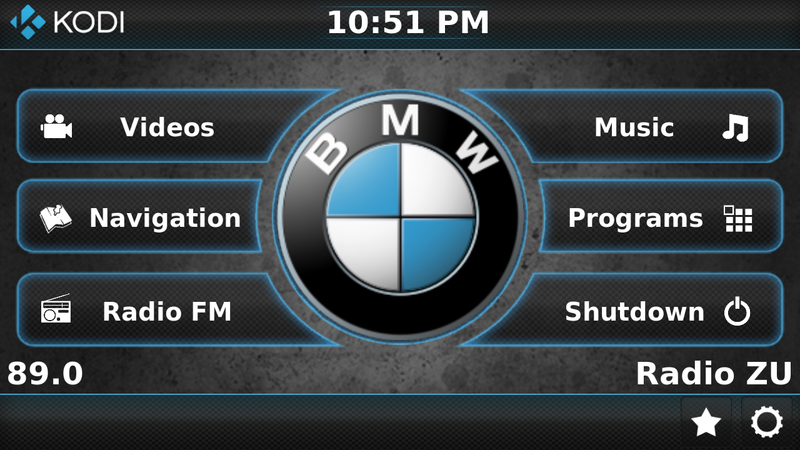 It increases efficiency a fair bit, but might hurt running a real time display off it. Could probably create some kind of connection point for this type of use, though. Try it and see how you go. Pi3 cradle (with audio circuitry and data/power wiring) back in the car. The Pi will soon follow. Drill press status: The chuck collar absolutely won't loosen. I'm still attempting to remove the spindle and bearings from the toothed quill assembly, but this is probably the first time since factory assembly and it really doesn't want to come apart either. I really want to get that chuck off and add a new one as well as replace the bearings, but might cave since screwing this up will result in a useless press. I can't find used spindle parts anywhere.